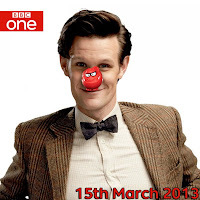 We've had the special 'minisode' 'Space and Time' on Red Nose day before, but now the BBC Doctor Who website has confirmed that The Doctor will be back once again in some proportion for this years television appeal on BBC One. The Official Doctor Who Website confirmed: "The Doctor will be making a brief appearance on BBC One during this year’s Red Nose Day on Friday, 15 March." We predict it'll be a little segment that The Doctor will be involved in followed by a small 'prequel' or trailer for the next run of episodes that begin on 30th March 2013.